Status: Rare casual spring migrant south and east. Rare casual breeder east. Rare casual fall migrant. Documentation: Specimen: UNSM ZM10394, 4 May 1911 Exeter, Fillmore Co.
Taxonomy: This species was split from Old World Common Moorhen G. chloropus by Chesser et al (2011). Common Gallinule (G. galeata) comprises seven subspecies, three in South America, as well as barbadensis of Barbados, cerceris of the Antilles, sandvicensis of the Hawaiian Islands, and cachinnans of southeast Canada, United States to western Panama, Bermuda, and the Galapagos Is. Nebraska birds are cachinnans. Spring reports are in the period 22 Apr-20 May. Of the approximately 40 Nebraska reports, all but four are in spring and summer. Summer: There are a few old records of breeding through the 1950s (Bruner et al 1904, Ducey 1988, Youngworth 1957), but no further reports until 1984, since when there have been nine. All are in wetter years when extensive wetland habitat occurred in southeastern Nebraska. In 1987, a breeding pair was found at Crystal Cove Lake, Dakota Co 5 May; they were last seen 29 Aug (Cortelyou 1987, 1988, Mollhoff 1989). A nest with eggs was found at Weis WPA (now part of Mallard Haven WPA), Fillmore Co in 1985 (Garthright 1985). In 2009, one bird was noted at North Lake Basin WMA, Seward Co 24 Jun and two adults with as many as 10 chicks were present 28 Jul-9 Aug (Brogie 2009); the following year, 2010, two were present 5 Jul but no evidence for breeding was noted. In 1984 nesting birds were found in two locations in Lancaster Co, Capitol Beach Marsh and what is now the Frank Shoemaker Marsh (Garthright 1984). In 1985 a nest with eggs was reported for Lancaster Co (Bennett 1986); at least one bird was found 12-22 Jun. In eastern Otoe Co an adult was found 5 Aug and a juvenile was accompanying it 10-Aug-13 Sep 1997. At least two broods were noted at LaPlatte Bottoms in Sarpy Co in 1998, when birds were present 18 Jul-30 Aug (Brogie 1999). A pair was tending a nest at Smith WPA, Clay Co 5 Jul 2017, but by 15 Jul the nest could not be found, suggesting failure. Additional breeding season reports, all from the southeast, are from Douglas-Sarpy Cos 2-23 Jun and 26 Jul-29 Sep 1959, one at the marsh in Fontenelle Forest, Sarpy Co 15-19 Jun 1994, and two at LaPlatte Bottoms, Sarpy Co 13 Aug 2016. In the eastern Rainwater Basin, one was at North Lake Basin WMA 7 Jun 1996 (Brogie 1997), an adult was at Waco WPA, Seward Co 11-20 Jun 2005, one was in southeast York Co 14 Jun 2008, an adult was at Kissinger WPA, Clay Co 20 Jul 2001, and a single was at Funk WPA, Phelps Co 20 Jul 2011. Fall reports are essentially last dates of summering birds, as Nebraska is at the west edge of the breeding range. The only fall reports not known to be associated with breeding are of one without details in Cherry Co 29 Aug-3 Sep 1933 (NBR 1:137) and an immature in Clay Co 30 Aug 1998 (Jorgensen 2012). More recently, the occurrences in 2018 of an immature in Seward Co 31 Oct-2 Nov and two in Sarpy Co 26-28 Oct, rather late dates, may have resulted from a late rise in water levels stimulating late breeding, or possibly post-breeding dispersal. Photograph (top) of a Common Gallinule at North Lake Basin WMA 1 Aug 2009 by Joel G. Jorgensen. Bennett, E.V. 1986. 1985 Nebraska nesting survey. NBR 54: 31-35. Cortelyou, R.G. 1987. 1987 (Sixty-second) Spring Occurrence Report. NBR 55: 50-67. Cortelyou, R.G. 1988. 1987 (Thirtieth) Fall Occurrence Report. NBR 56: 10-31. Garthright, W.C. 1984. 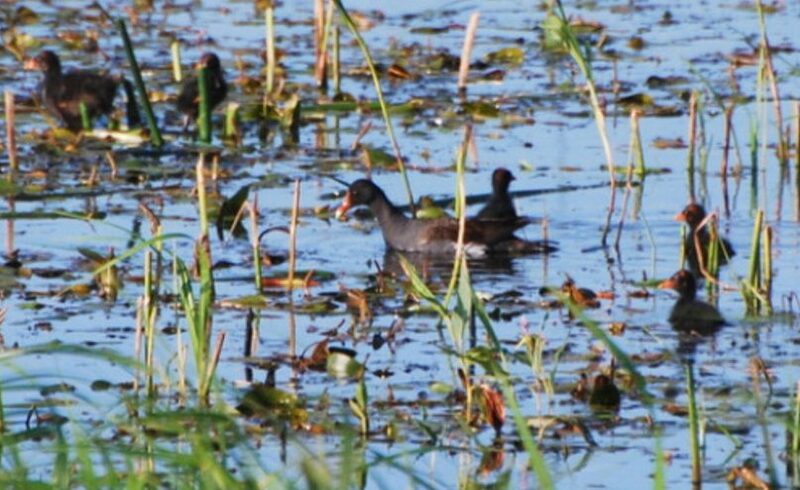 Nesting Common Moorhen in Lancaster County. NBR 52: 74-75. Garthright, W.C. 1985. Fillmore County. NBR 53: 76-77. Youngworth, W. 1957. The birds of Dakota County, Nebraska. Occasional Papers 3. Crete: NE: Nebraska Ornithologists’ Union.